Name that Chameleon, Win a Class for Two! Home » Blog » Name that Chameleon, Win a Class for Two! 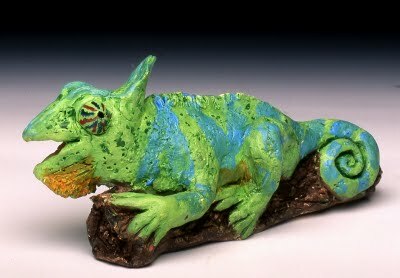 Posted by cindy on Jul 9, 2011 in Blog | Comments Off on Name that Chameleon, Win a Class for Two! When I chose this photo of a happy chameleon for my postcards for teaching clay sculpture classes, I had no idea how popular s/he would become. People of all ages have remarked that they picked up the postcard because of his (her?) great expression. Even I still smile when I look at the photo. Well, it’s time for this joyful Spokeslizard to have a name. Please send me your best suggestions and the author of the name chosen will win a 2-hour sculpture class for two people (includes clay and one firing) at Out of the Fire Sculpture Studio, in Saxapahaw, NC. Anyone may enter! E-mail your entries to cbiles@triad.rr.com, or find the studio on Facebook: Out of the Fire Clay Sculpture by Cindy Biles. Deadline to enter is August 31, 2011. I’ll post the winning name on Facebook and here in September.